Eyvind can think of no more glorious future than becoming a Wolfskin, a warrior devoted to the service of the mighty war god Thor. His closest friend, Somerled, a strange and lonely boy, has his own very different ambitions - yet a childhood oath, sworn in blood, binds these two in lifelong loyalty. Meanwhile, far away across the water, on the Light Isles, the king's niece Nessa is beginning to learn the ways of the mysteries - though neither the young priestess nor her people can realize what lies ahead for them." "Eyvind and Somerled seem set to follow very different paths: one becoming a fearless servant of the Warfather, the other a scholarly courtier. Then a voyage of discovery, led by Somerled's brother Ulf, brings the two friends together again in accompanying a group of settlers to some beautiful islands rumoured to lie across the western sea. However, their good spirits are dampened by a tragedy on board, which Eyvind begins to suspect may not have been an accident." Ulf's new settlement begins in harmony with the native islanders, led by King Engus. But one day, on a trip to a holy place of the Folk, a brutal murder occurs and that peace is shattered. It is now that Eyvind begins to feel the restraining ties of his boyhood oath...and to realize what sort of future Somerled had in mind for himself all those years ago. 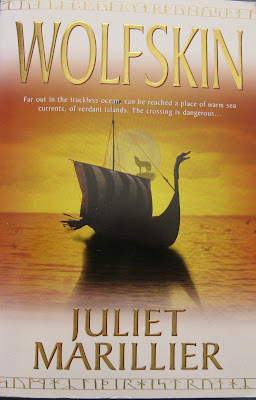 Wolfskin by Juliet Marillier, my first book read in 2016 and the first time I have ever read a book by this author. I wish to thank Sheree from The Eclectic Reader for suggesting this author to me when I was searching around for New Zealand authors in early 2015. What a saga, eventually I was swept up into the magic of storytelling. It took me a little while to be immersed in it, but once I was, I was reading into the night and picking it up as I ate breakfast! Eyvind was a character that I just grew to love more and more. His desire in life has been to be a wolfskin, a warrior who is brave, at the forefront of battle. Not surprisingly not expected to see old age either! Eyvind never expected to change from that path, but circumstances decreed otherwise. As Nessa says to him "Things never stay the same, Evyi. People change. Paths change. You cannot know, when you are young, what life will hold for you as a grown man or woman..... It seems to me there is always a choice, there must be. No blood oath could make me act cruelly, or falsely, or in defiance of natural laws, no matter how solemnly it was sworn". As Eyvind makes his way in life, always truth, loyalty, friendship and honour guide his heart. But sometimes that is not enough and tough decisions and choices have to be made. Sometimes courage is being at the forefront of the truth, whatever the cost. Somerled is thrust on Eyvind when they are boys and he takes him under his wing, teaching him what he knows and making a blood oath to be brothers loyal to each other. While Somerled had some extenuating circumstances, it was difficult to like him. I hated how he undermined Evyind's belief in himself in terms of intelligence. I hated him for a lot more, but I don't want to say what, so as not to destroy the story for any reader. Nessa the priestess in training and niece of the King of the Light Isles was a joy, full of wisdom and courage and love. Hers was eventually a burden of deep sorrow, but as she says there is always a choice. I loved her relationship with the priestess Rona, I loved how she found her way forward. I loved how the beliefs and views mingled - there is the Christian viewpoint through the viewpoint of the holy man Tadgh, the god of the Norse and the ways and beliefs of the Folk on the island. In many ways they all held values and truths that were similar. I am reluctant to leave these people. I held my breath, I wondered, I wept, I smiled. It won't be too long before I will be seeking out Foxmask, the second book in this duology. I'm so glad your first read of the year was a good one! Hopefully it sets the tone for the whole year! Indeed Kate, it was a great start to the year. My first book so don't know, on the whole this was uplifting by the end. I'm glad you you selected a terrific book to start the new year with. I like the quote you've included in sharing your thoughts about this book. This sounds like a very meaningful novel. Yes, it appealed to me Pat too. I know, for a long time I thought this isn't fantasy, but it does come in later in the book. How wonderful to find yourself so absorbed in your First Book of the Year...and while it is not my usual read, I can see the appeal of the story and the characters. Thanks for sharing. Wasn't my usual read either, although I do go out of my usual path for such books and have done so before. Kathryn great review!! I saw this on your shelf last week and was impressed by it. Its now on my wish list! Not my usual read, but sometimes a challenge of a book just hits the spot which in this case it did. It's nice that you first read of 2016 was so enjoyable. I read one book by this author (Shadowfell) and didn't really enjoy it, but I would give her another try. Yes I don't think this one would be for every reader either. I am going to read the follow up and then try another of her series to see how I go with it. So glad your first book read this year was good! Would hate to start the year off with a DNF or low star book, so it is great. I am looking forward to Foxmask to see if Somerled redeemed himself! Will take some doing!! Nice review! I really like her writing but haven't read this yet. The pacing of her books is usually slow. Hope Foxmask is equally good!